Certain species can cause economic and environmental harm. Find out if there's any truth to the rumor. Read more about Is It Illegal to Pick Bluebonnets? Be part of the solution and volunteer with the Don’t mess with Texas Trash-Off. 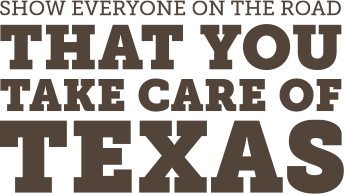 Readers of this blog are dedicated to taking care of Texas, but don’t forget to get out and enjoy our state, too. People from all over our state are doing their part. Check out the remarkable amount of scholarship opportunities.